Hi everyone, Steph here with an exciting discovery. I have vellum - tons and tons of vellum. I rarely use it, however, because I hate when the adhesive shows through the project I've created. I think I've tried every vellum adhesive on the market and I couldn't find one that I loved enough to use on vellum. Late one night, I was playing around with Faber Castell's Gelatos and was wondering how they'd work on vellum. At long last, this embossed butterfly vellum was about to be used. 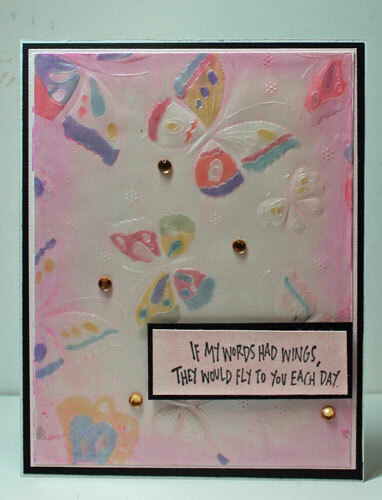 I first colored the reverse side of the butterflies with Zig Scroll & Brush Markers. Turning to the front side, I added color to the background with an assortment of Gelatos. 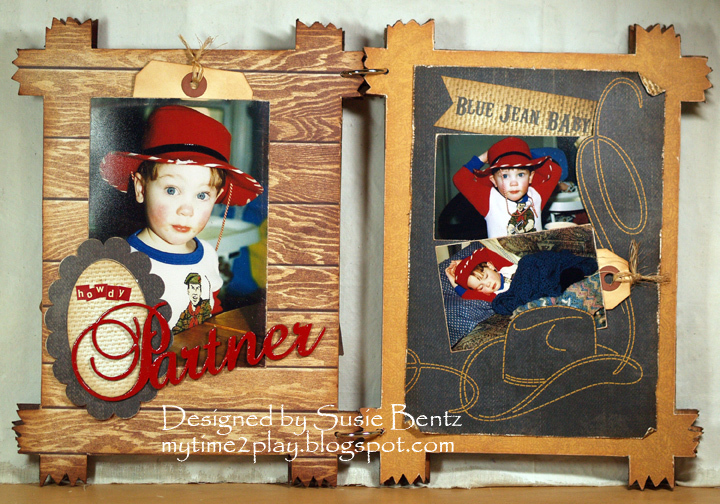 I love the result, but my quandry was how to adhere the vellum panels. I grabbed a bottle of the Best Glue Ever. This Glue is very sticky so I knew it would adhere very well, but I wasn't sure about using it with vellum. So, very carefully, I added a little BGE around the edges of my vellum. 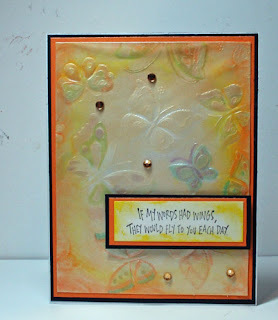 I then placed the vellum on white cardstock (so the beautiful butterflies would show up) and waited. Within minutes the BGE dried and it dried clear!!!!!! Wow, how impressive is that! No adhesive was showing through my project. I realized after it dried completely, that I should have used more adhesive on the vellum. 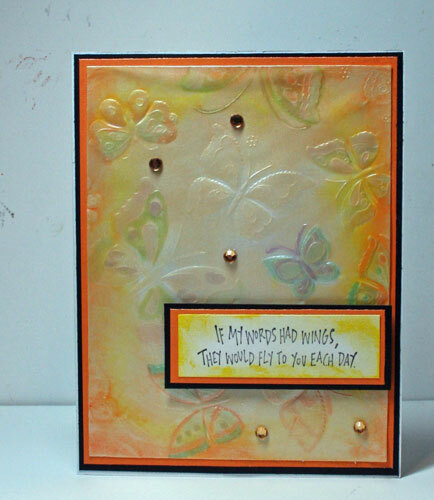 The orange panel did not completely stick to the cardstock! But, I was being cautious and I wanted to see how the BGE dried before really commiting myself. 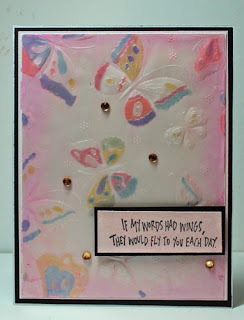 Now that I knew the BGE would not show through the vellum, I totally commited myself to this pink based card. I added a line of BGE along the edges of the vellum and used my finger to rub the adhesive into the panel. I again placed the panel on white cardstock. Within minutes my panel was dry and the adhesive was not showing!!! I also added a drop of BGE to the rhinestones to be sure they'd stay put! So try using the BGE on every project - you will be thrilled! ...then gently smeared it with my finger. 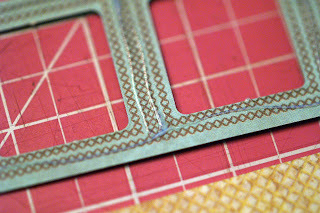 I had previously traced and cut the paper to match the page so I lined up the edges and laid the paper down, smoothing it with a brayer. The glue dries very fast when it is applied in such a thin layer so be sure to work quickly. ...or for holding the finger-pleated ruffle on the page below. In short, I use it for everything! 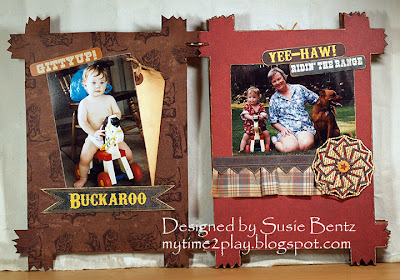 The paper for this project is one of Moxxie's newest releases, Western Round Up, and I absolutely love it! TIP ALERT! 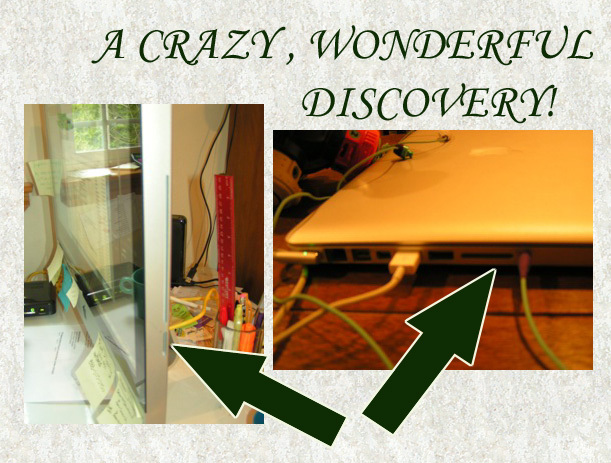 A Crazy-Wonderful Discovery!!! Perhaps yours does too and you don't know about it either....SO WHAT is it????? >>>>>A built-in SD card slot! • No more looking for the cable to connect the camera. • No more searching for the SD card plug-in adapter. • No more worrying on trips that the SD card is nearly full. JUST SLIP IN the CARD and the images UPLOAD to the COMPUTER.! Easy-Peasy simple. It just amazes me because this is such a great feature that I didn't know I had. I DO know I'll be using it a lot from now on, however. I'm hoping that your computer has it too... and if you didn't already know about it, I'm hoping this post makes your day a little easier! Fixing Tools - Part 2! Hi everyone! Susie here today with a follow up on Steph's blog post! I also have a much loved and well-used ink blending tool that needed a repair. In my case, the velcro that is supposed to hold the removeable/replaceable blending foam kept pulling off every time I changed the foam. ...and put the velcro back in place. Once the glue dried, my ink blending tool was as good as new. Trust me...there is no way that velcro is ever going to come off again! Don't you hate it when you go to use a tool and you find it's broken? My ink blender tool has gotten a lot of use over the years and the last time I went to use it, the handle fell off!!! Definitely annoying especially when I was planning on using it!!! So I pulled out the Best Glue Ever and added a little glue to the cavity. I then put the handle in the cavity, picking up some of the glue. I removed the handle, waited a few minutes for the glue to get tacky, then put the handle back in. I held the handle in place for 2 minutes. My tool is now perfect thanks to the Best Glue Ever. BGE Always in my Crop Bag: Paper, Plastic, Fabric, Chipboard! 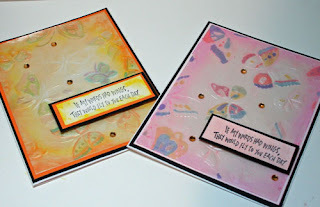 This recently created layout, using paper from Moxxie's Homespun Easter collection, is the perfect example of why I always carry The Best Glue Ever in my crop bag! ...then I used the BGE to adhere the plastic buttons to the strip. 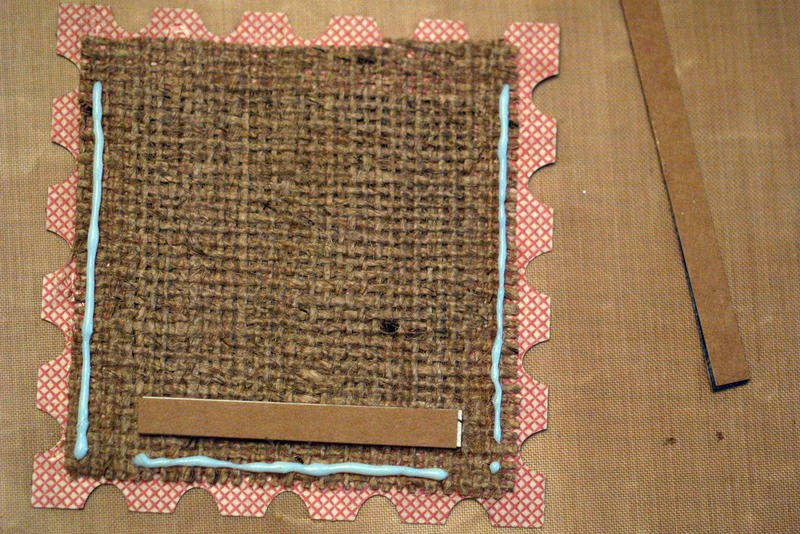 ...and then added cardboard spacers to the back so I could use the assembly to create a pocket for hidden journaling! 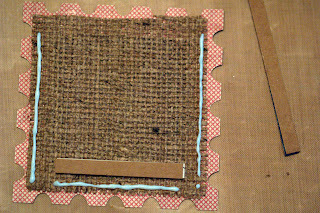 The flower on the front of the burlap pocket, created from coffee filters and Tim Holtz Tattered Flowers die, was adhered with a glue spot created with the BGE. 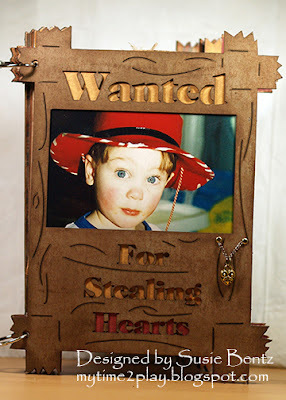 The final touch was the fancy chipboard word "Cherish" from Want2Scrap. It is basically bare, just darkened a little bit with Tea Dye Distress Ink, and then adhered with tiny glue spots created with the BGE! For details on how I did the stitching and for a chance to win the Homespun Easter collection from Moxxie, check out my blog. Thanks for stopping by and be sure to pack a bottle of The Best Glue Ever for your next crop!